Been meaning to mention this since it started last week - there's a new Prestige Collectibles Auction going on until May 15. Details are here. 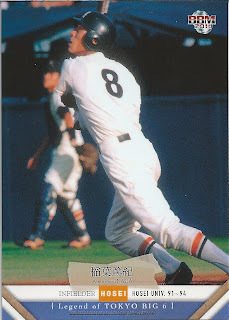 One really cool item up for auction is a 1962 menko card of Larry Doby, when he played for Chunichi. The auction description is incorrect when it says that Doby is the only US Hall Of Famer to have played in Japan as Rich Gossage played for the Hawks in 1990. However, Gossage didn't have any cards, so Doby's the only one you can get a Japanese card of. Over the last couple weeks, BBM has announced this year's editions of the Carp, Giants and Marines team sets. The Carp set has 109 base cards (including apparently one for Kenta Maeda's no hitter on April 6), a nine card insert set (Soul Of CARP) and various autograph and jersey cards (looks like for Kenta Meada and Yuya Fukui, including cards with autographs or jerseys for both). 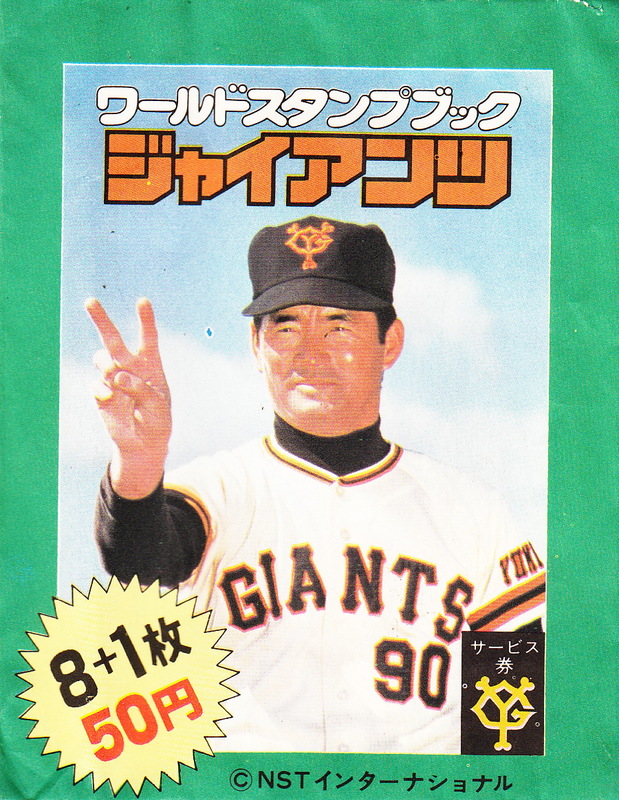 The Giants set is a whopping 127 cards with (I think) two nine card insert sets (Young Giants and Super Metallic Giants) and memorabilia cards featuring up to four player's jerseys. 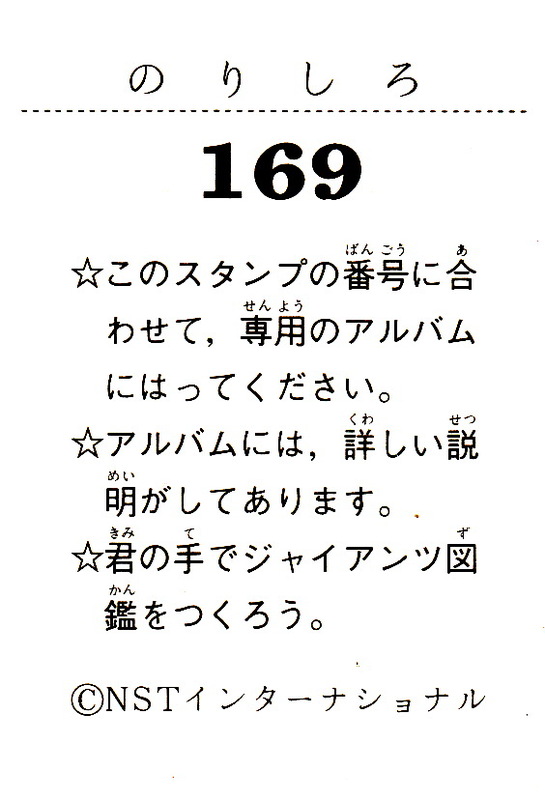 The Marines set has 99 base cards, a nine card insert set (Counterattack Of Marines?) and memorabilia and autograph cards (the memorabilia cards have jerseys of Yoshihisa Naruse and Yuki Karakawa - one each by themselves and one with both). 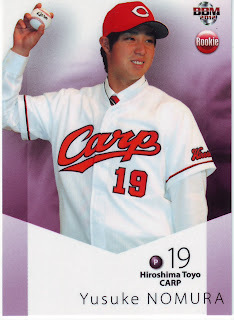 There's no release date listed for the Carp set. The Marines set will be out in mid-May and the Giants set will be out in late-May. 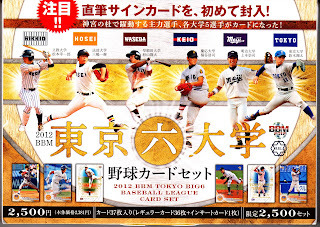 In addition, BBM is releasing a box set to commemorate the Baystars being bought by DeNA. 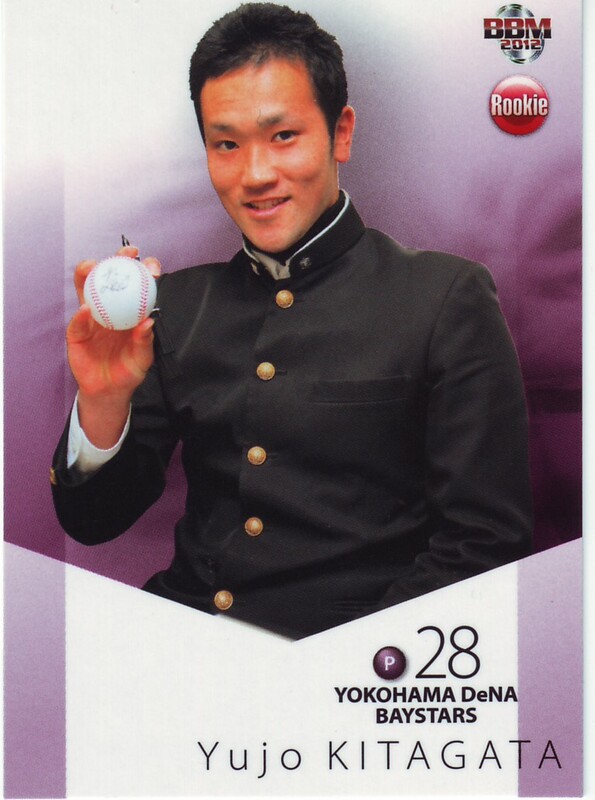 Called "Reborn", the set will contain 28 cards - 27 cards for players (and manager Kiyoshi Nakahata) and one "special" card. 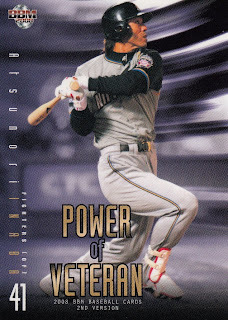 The "special" card will either be one of 12 "Newcomer 4 Hometown" insert cards or one of 10 possible memorabilia cards featuring jersey, bat or patch pieces from up to three players. 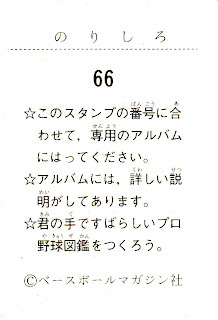 The set will be released in mid-May. 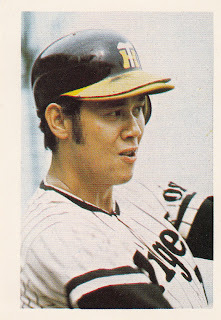 After Yamakatsu and Nippon Ham, the other big card manufacturer of the late 1970's (besides Calbee of course) was NST. 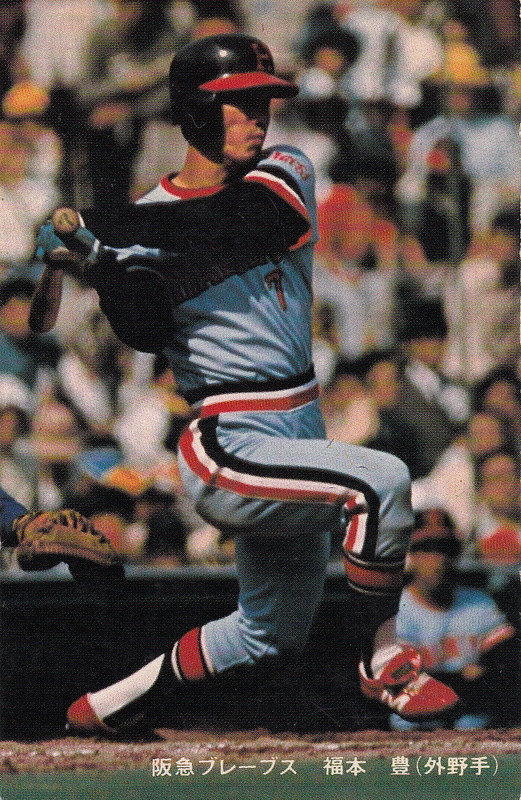 Between 1975 and 1983, NST produced four large sets of 2 inch by 2 7/8 inch cards. 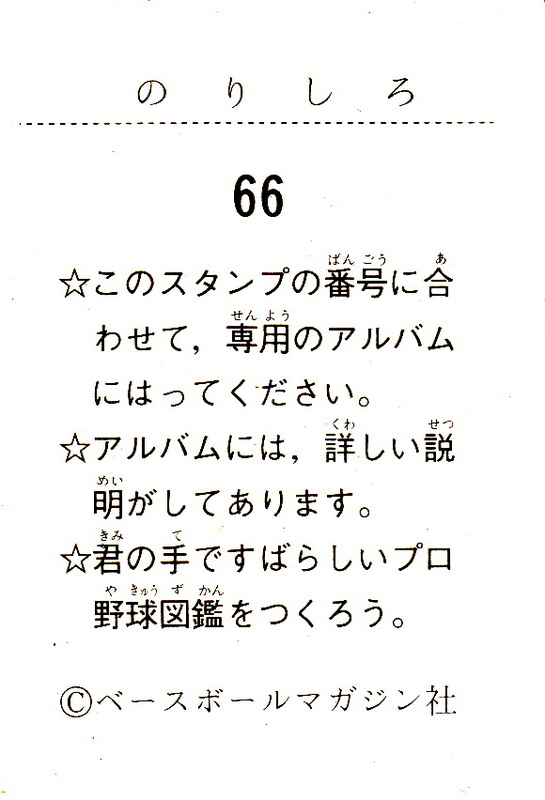 Technically I guess the cards are really stamps as they were intended to be pasted into albums that (I assume) were sold in conjunction with the packs of cards. At least two of the sets had a parallel set of thicker stock cards also. 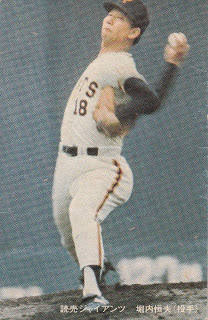 The sets were very Giants-centric - the last two featured only Giants players. 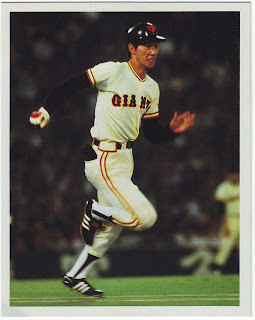 The fronts of the cards in all four sets are "pure card" - white border photos with no text whatsoever. NST's final set with 288 cards was released in 1983 and it also is completely dedicated to the Yomiuri Giants. 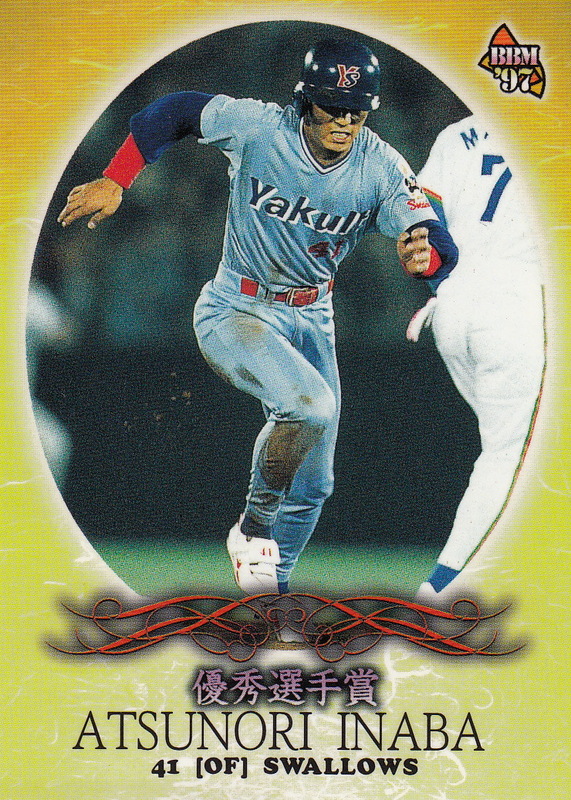 I don't have any cards from this set, so I can't say too much about it. 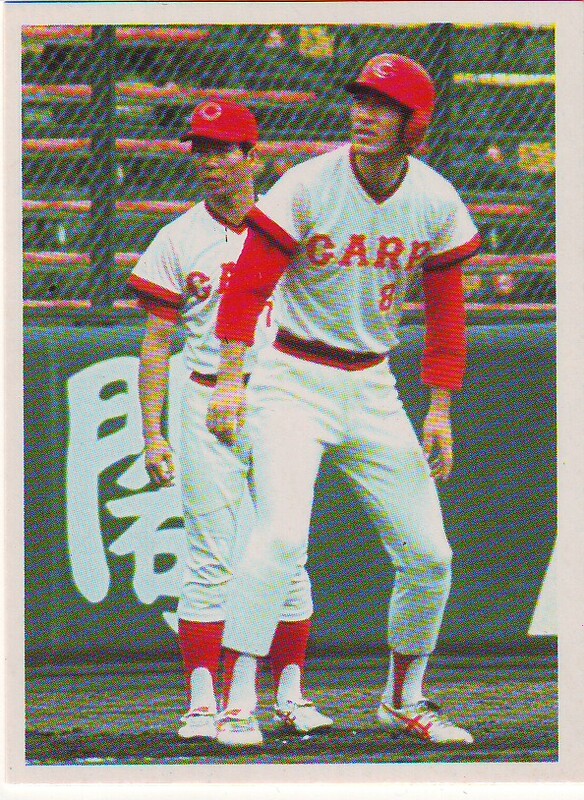 It appears from Gary Engel's "Japanese Baseball Card Checklist and Price Guide" that the backs were a different format than the earlier sets although it is not clear if they are identical except for card number in the set itself. 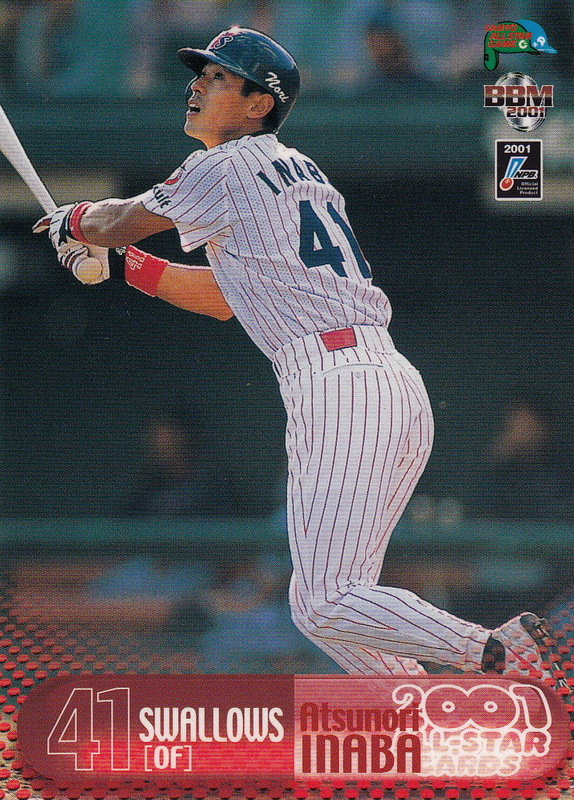 Sometime this weekend, Atsunori Inaba of the Fighters most likely will get his 2000th hit - he homered yesterday for hit number 1999. 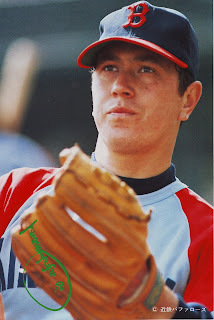 I thought I'd do a little retrospective on him in anticipation of his milestone (since I have time right now but might not later). He spent the 1995-96 offseason playing for the West Oahu Canefires of the Hawaiian Winter League with future fellow NBP players Gabe Kapler and Matt Skrmetta. 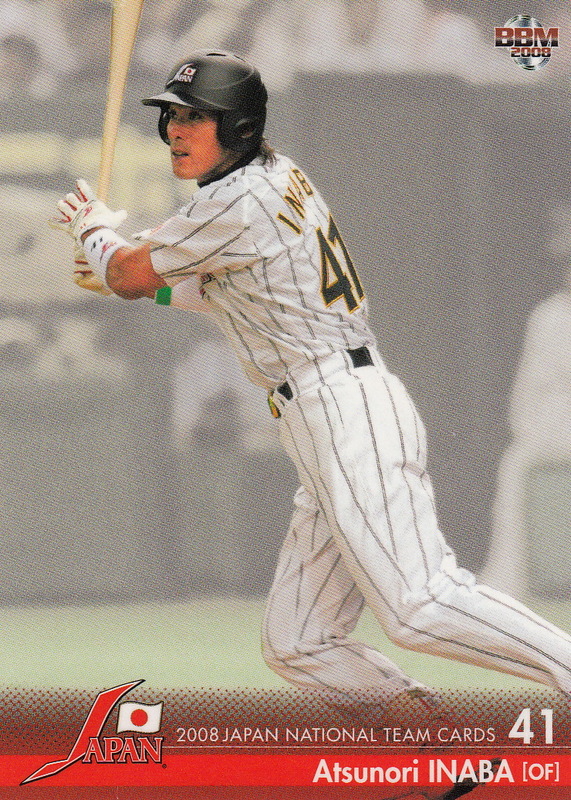 He remained with Yakult through the 2004 season, returning to the Nippon Series again in 1997 and 2001. 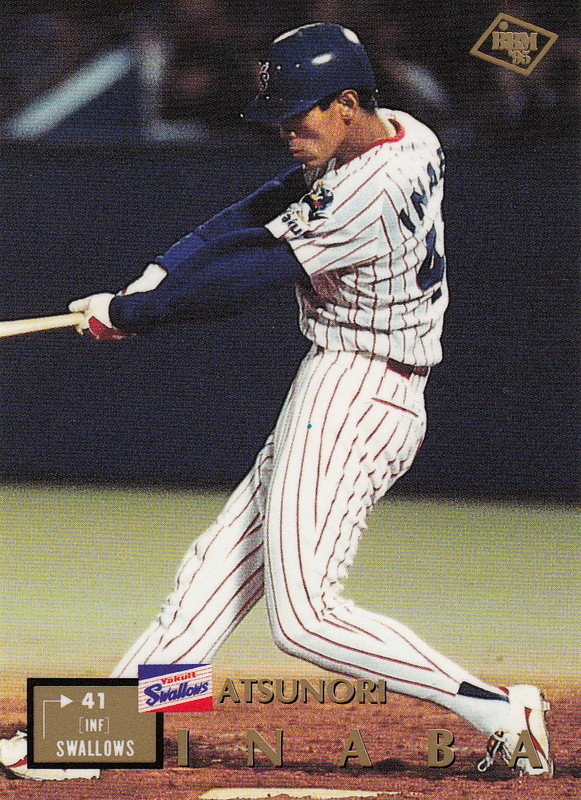 He set a record in the 1997 Series for more hits (10) in a five game series and won one of the "Outstanding Player" awards for that Series. He joined the Fighters before the 2005 season and has been in Sapporo ever since. 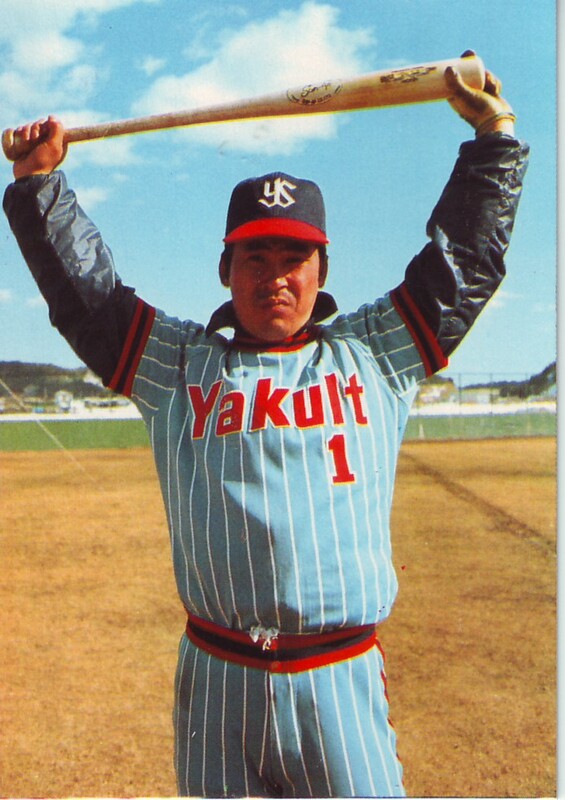 He's gotten a lot more playing time with the Fighters than he had with the Swallows, having gotten over 500 plate appearances every year in Hokkaido except his first while only once having more than that in his 10 seasons with Yakult. 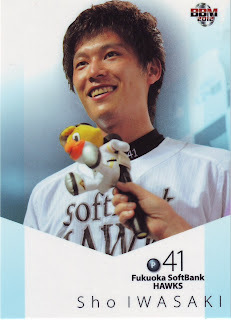 He appeared in three more Nippon Series (2006, 2007 and 2009), winning the Series MVP award in for the 2006 Series. He won the Pacific League batting championship in 2007 along with leading the league in hits. Inaba made the All Star team twice when he was with the Swallows (1997 and 2001) and another 5 times (2007-11) with the Fighters. 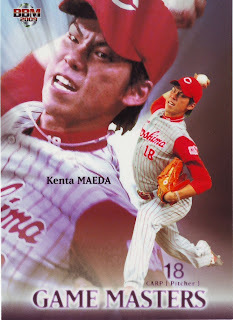 He was the number one vote getter in 2009 and was MVP of the third All Star game in 2011. 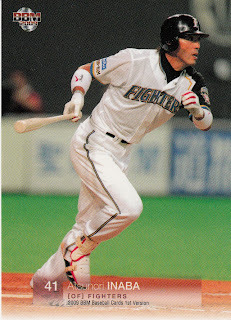 He also made the post-season Best 9 team five times, once with the Swallows in 2001 and 2006-09 with the Fighters. 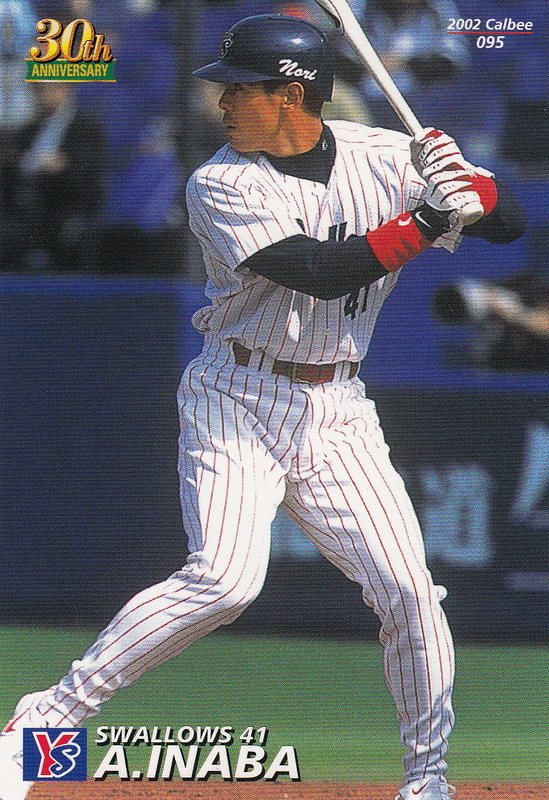 In addition, Inaba was named to Team Japan for both the 2008 Olympics and the 2009 World Baseball Classic. He does not appear in any of the card sets Topps put out for the 2009 WBC but he does show up in the 2008 BBM Olympic team set. 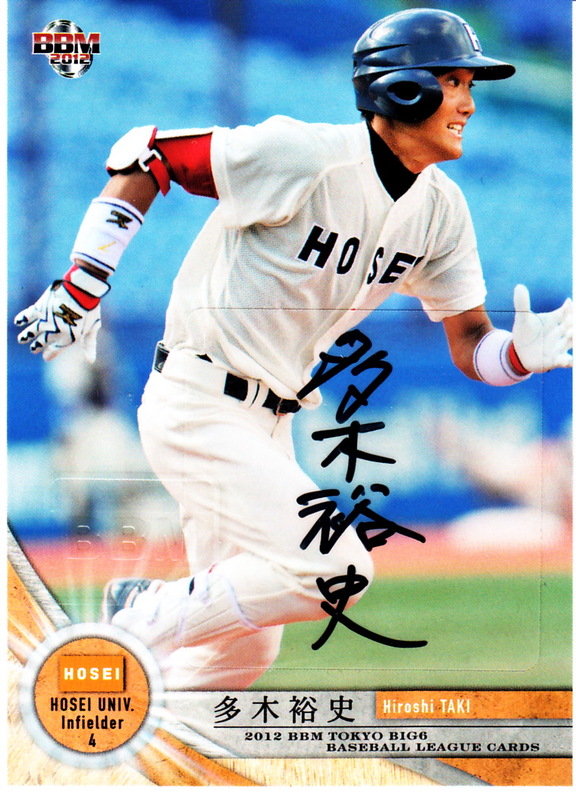 Each of the autographed player cards is serially numbered to 30 with the exception of Taki and Yuhei TakahashiTakanashi of Waseda - their cards are only numbered to 29. 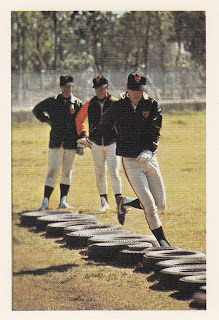 All the regular cards can be seen here. 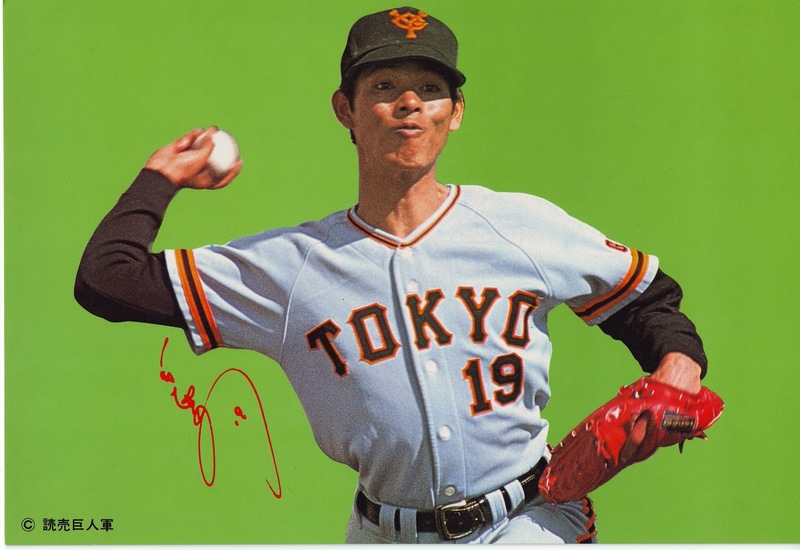 Jason alerted me recently to a fellow going by the name of Taka Tanaka Giants who is an American (I think) living in Japan who is posting videos of himself opening packs of Japanese baseball cards (and showing off stuff he's won in auctions) on YouTube. 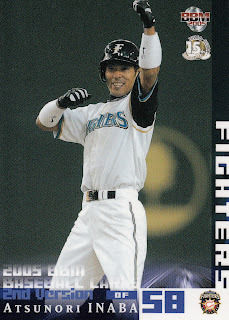 Very cool to see the product come out of the pack and see what the insert and memorabilia cards look like (since I pretty much skip them because they're generally more expensive then I want to pay). He also just started a blog. 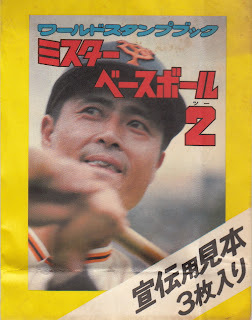 Just out of curiosity, I did a quick search on YouTube to see what videos about Japanese Baseball Cards were out there. There's a couple from Gwynar, who writes the amazing and indispensable YakyuBaka blog, talking about 2007 Calbee cards as well as some others by various people doing pack breaks or showing off stuff they are selling. I hate showing the same player two weeks in a row, but I wanted to mention two things about Darvish. The first is that he had a very good outing against the Tigers on Thursday, lowering his ERA by over a run. 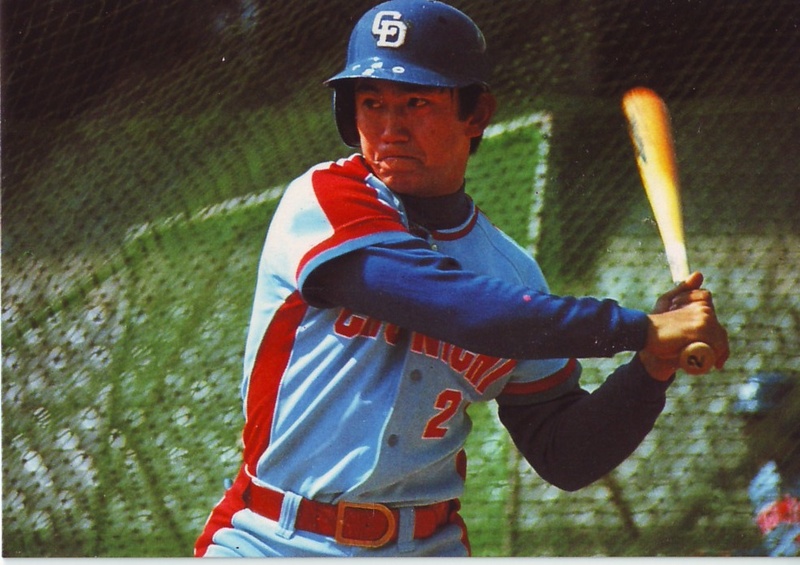 I'd still like to see his strikeout to walk ratio improve, but it looks like he is adjusting pretty well. The second is something I noticed while looking through the 2012 BBM 1st Version cards that are posted online at Jambalaya (I'm still waiting on my set to get here from Japan). 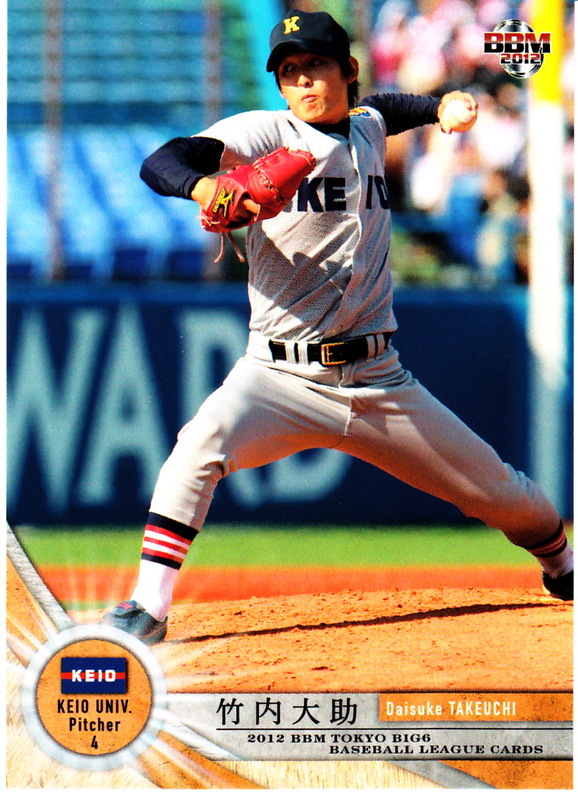 While looking through the Leader subset, I noticed that there was no card commemorating Darvish leading the Pacific League in strikeouts last season. I'm not positive, but I think this may be a first. 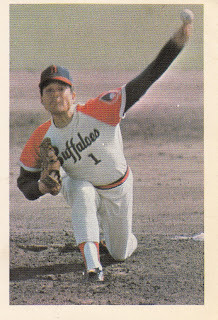 Prevously, anytime someone who had led the league in something or gotten an award had gone to the US the following season, BBM still had a card of them in the appropriate subset or insert set the following season. For instance, the 2001 BBM set featured Leader subset cards and both Best 9 and Golden Glove cards for Ichiro, despite the fact he spent 2001 with Seattle. 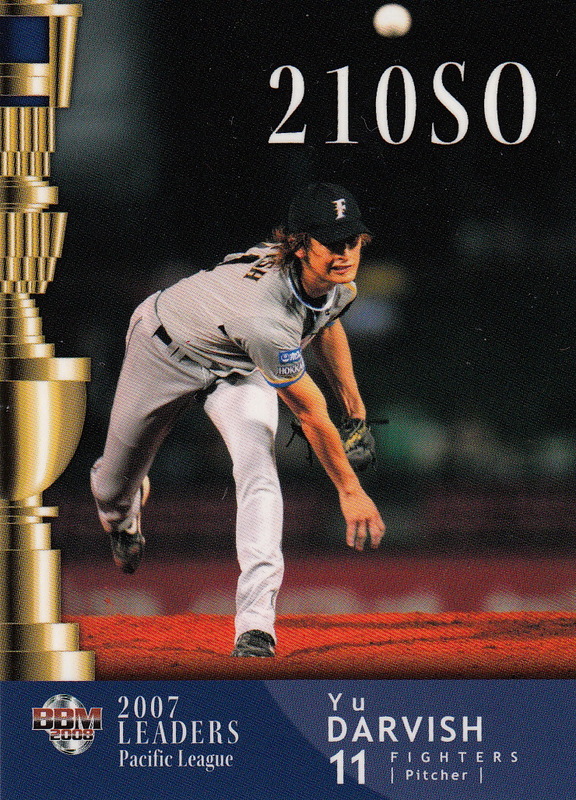 Similarly, there was a 2002 Golden Glove card for So Taguchi, several 2003 Leader subset cards for Hideki Matsui, a 2004 Best 9 for Kazuo Matsui, 2006 Best 9 and Golden Glove cards for Kenji Johjima, etc, etc, etc...up to a Best 9 and a couple leader cards for Tsuyoshi Nishioka last year. 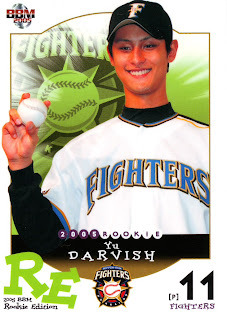 So it is completely unprecedented for BBM to not have a Darvish leader card. I have no idea what the reason is for the omission - I don't know if there's some sort of licensing deal that Darvish decided not to participate in or if it was a decision by BBM not to include him. I wrote about the Yamakatsu sets from the late 1970's a couple weeks ago. 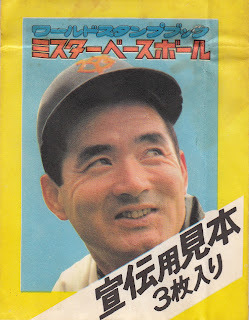 Yamakatsu was not the only non-Calbee maker of baseball card sets in that time period. 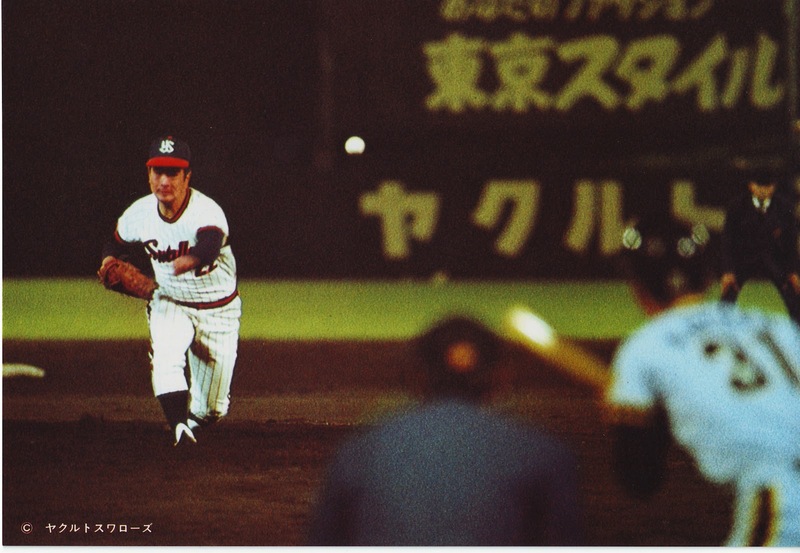 There were two other companies of note - NST and Nippon Ham. 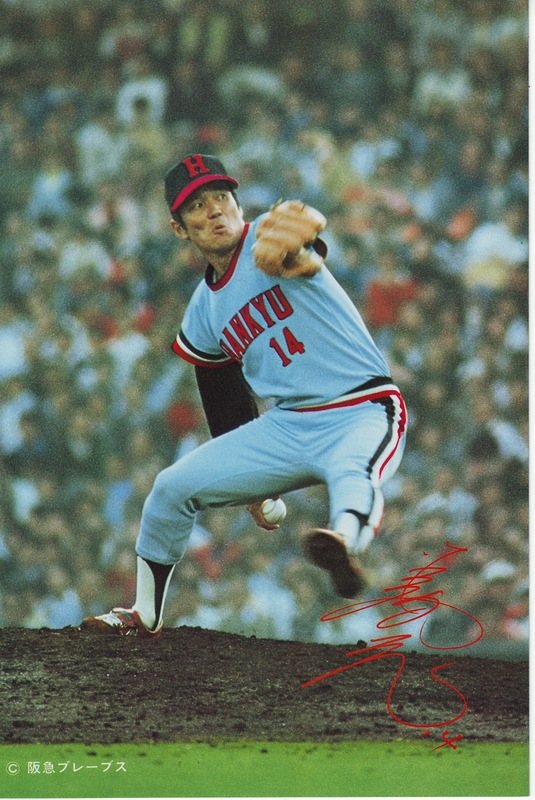 I plan on talking about NST in the near-future but today I'll concentrate on Nippon Ham. The photography in these two sets isn't anywhere near as nice as that in the Yamakatsu sets, but I like these sets anyway. They are difficult to come by - I lucked in on a lot on eBay once (in fairly poor shape - there's magic marker writing on the backs of a couple of the cards) but I don't see them offered very often. 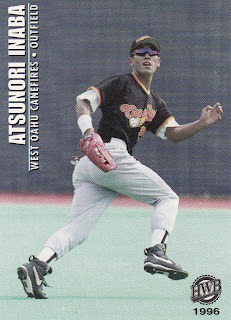 Yu Darvish had his first two start for the Rangers this past week - Monday vs the Mariners and yesterday vs the Twins. He's currently got a 4.76 ERA and opponents are hitting .340 off of him - which considering his opponents so far were the worst two AL teams last year is not a good sign. His next start is this coming Friday against Detroit and the Ranger play the Yankees next week, so things are about to get more difficult. I read things saying that he's adjusting, but honestly, other than the number of runs given up, both his starts look very similar statistically - (same number of innings pitched, batters faced and walks given up, almost the same number of pitches thrown, strikeouts and hits). It's early and he's learning, so I hope it goes better for him in the future but those are two very scary lineups he's dealing with in his next two starts. UPDATE - After looking at his stats a little more, I think I'm being too hard on him. He hasn't pitched that bad since the first inning on Monday where he gave up four of the six earned runs he's been charged with. 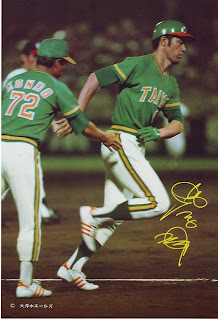 I still would like to see what he does against the Tigers and the Yankees and I'd still like to see him get a little deeper in games, but he's probably doing better than I first gave him credit for. BBM released their annual Rookie Edition set in late February. Like the previous editions, this set showcases the players taken in last fall's draft. The set contains 111 cards - 97 cards of the drafted players, a two card sort-of-checklist subset (showing each drafted player) and a 12 card subset of active players - I think the intent is that they be the top rookies from 2011 for each team as it includes both 2011 Rookies of the Year (Hirokazu Sawamura and Kazuhisa Makita) along with Yuki Saitoh (naturally). 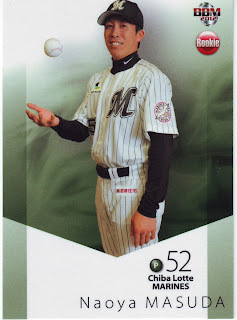 The cards of the drafted players look pretty much like they always do. 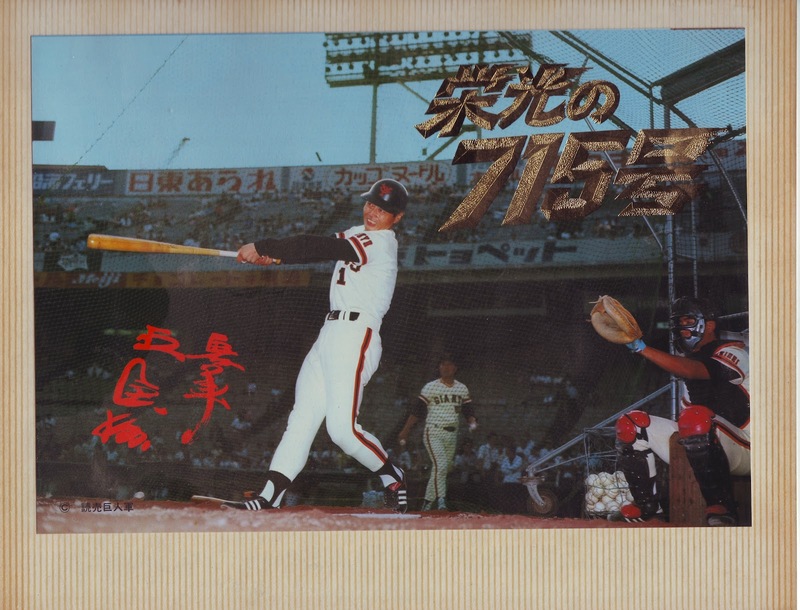 The pictures are taken at the ceremonies that each team introduces their draft picks at, so they're kind of monotonous after a while - lots of "guts" poses, pitchers posing with baseballs, hitters posing with bats, etc. 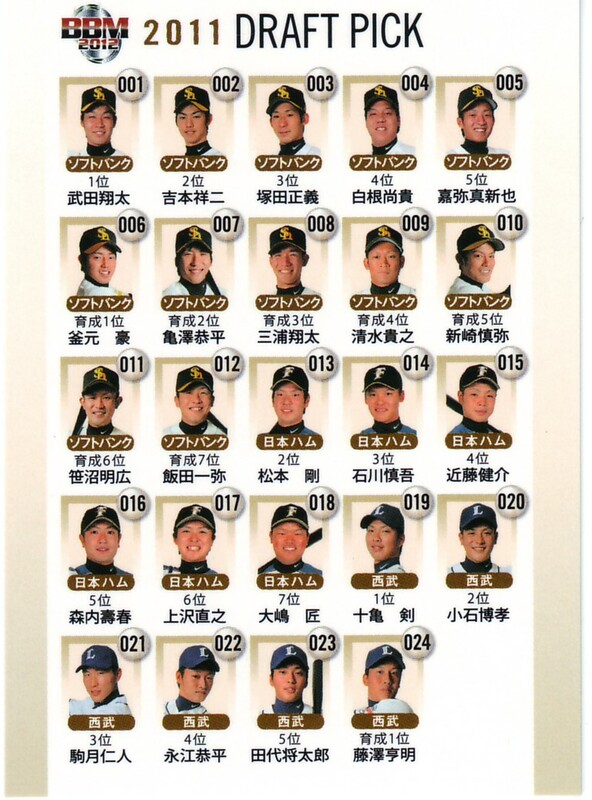 Since the Dragons and Baystars were doing new uniforms this season they decided to have their draft picks wear suits - the other 10 teams have their players in their home uniforms. The two checklist cards show only the drafted players, not the active players. 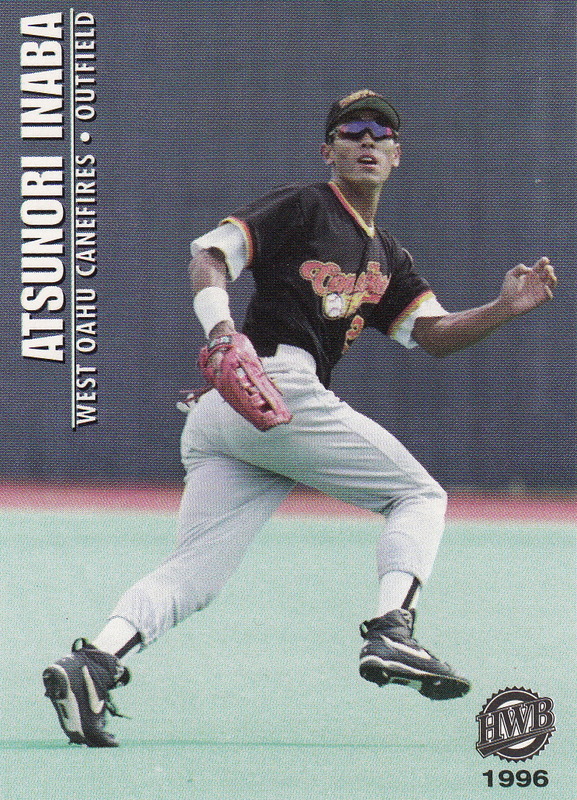 Card #98 shows the Pacific League draftees. Card #99 shows the Central League draftees. 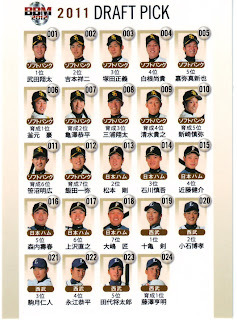 Although the draft is officially known as the 2012 draft (and is reflected on the back of the player's cards as such), the checklist refers to them as 2011 draft picks. 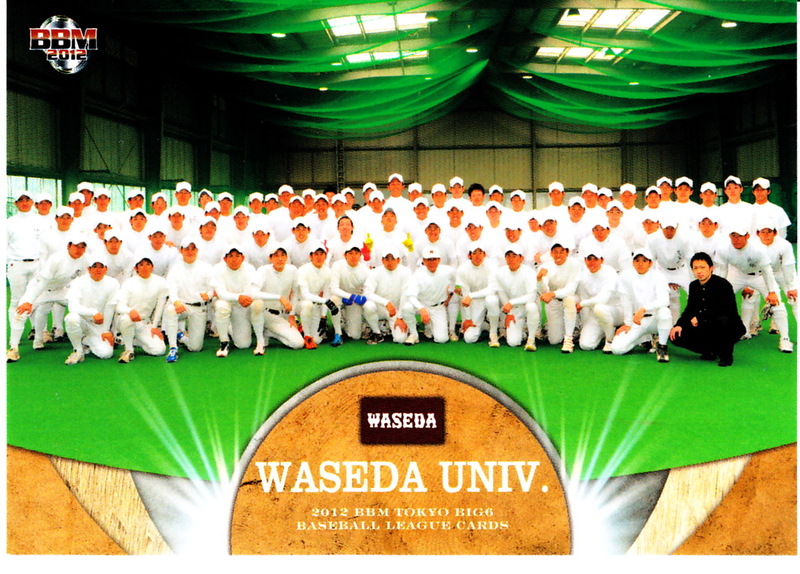 As always, you can see all the cards here. This is the tenth edition of this set. 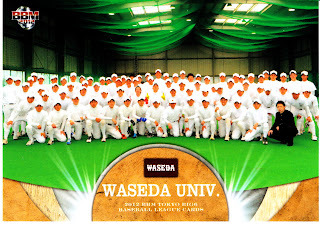 I still think they should show pictures of the players on their amateur and industrial league teams rather than from the introduction ceremony. BBM has released information about a couple of sets in the last week or two. 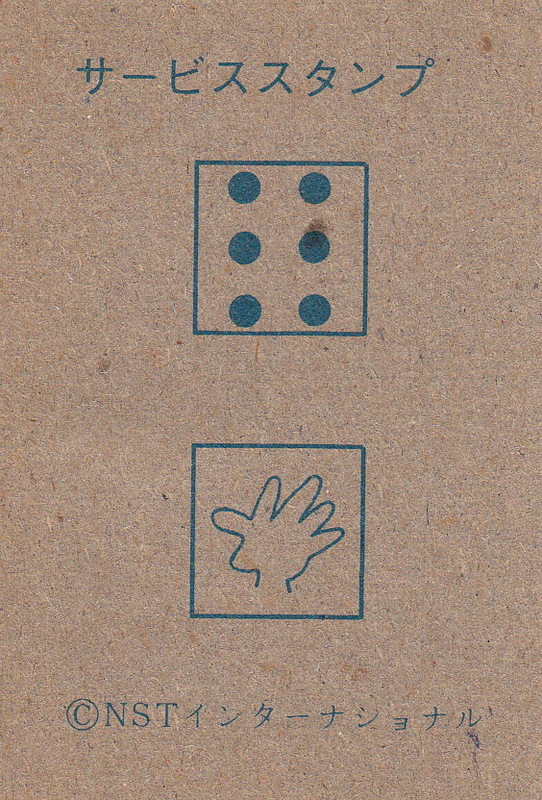 The first one is called "Diamond Age 1989". 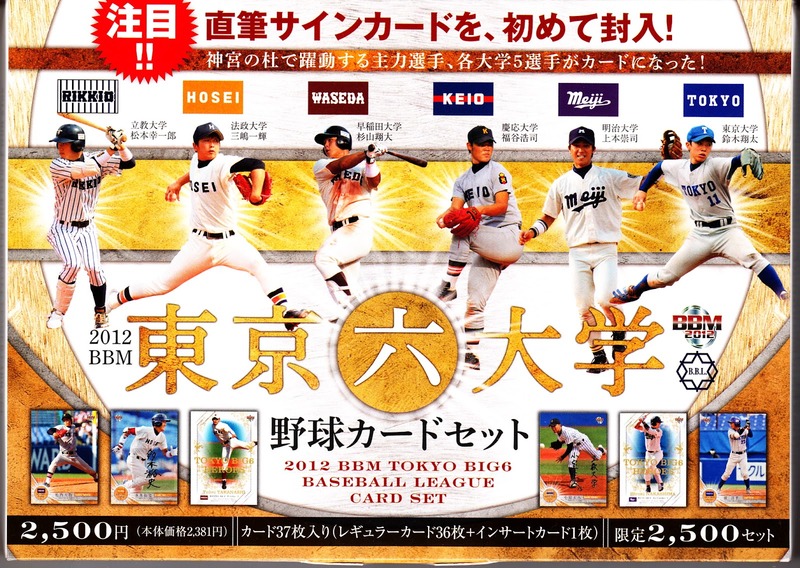 This is a 28 card box set with 27 "regular" cards of players born in 1989 like Sho Nakata and Yusuke Nomura plus one additional "special" card - possibly a parallel issue, an autograph card or a memorabilia card. 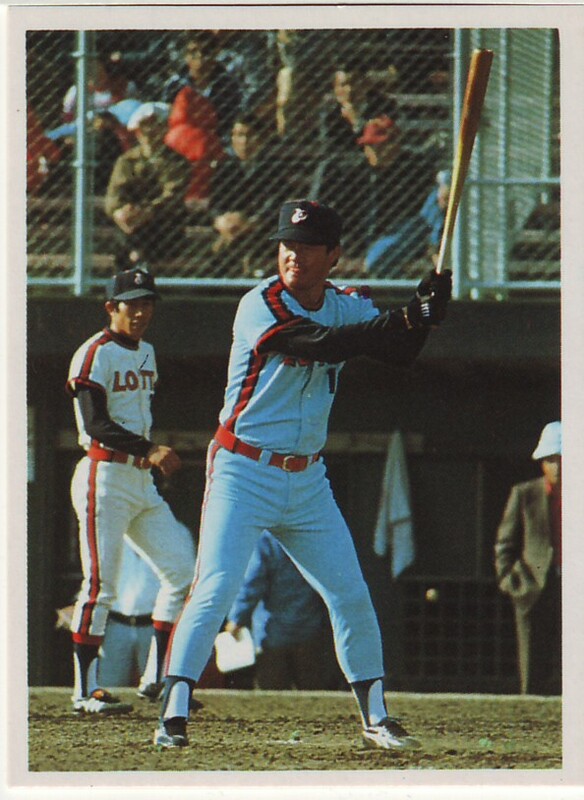 Oddly enough, BBM didn't publish information about this set until after it came out (in late March) so you can already see all the cards for the set at Jambalaya. 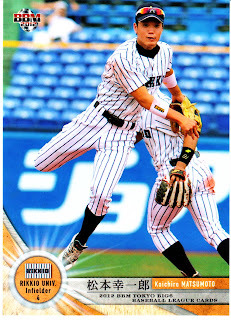 The other set is the 2012 Tokyo Big Six Spring Version set. As usual, this is a 37 card box set featuring 30 player cards (5 for each of the six university teams), 6 team cards and a "special" card. For the first time, the "special" card could possibly be an autographed card. 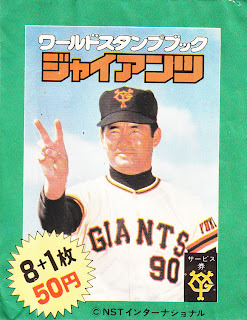 Otherwise, the "special" card will be one of six "Tokyo Big 6 Heroes" cards. I believe that the set has already been released although it is not listed on Jambalaya yet - I just paid AmiAmi the other day for my set and they told me that it's been shipped. Hiroshima Toyo Carp pitcher Kenta Maeda threw a nohitter against the hapless Yokohama DeNA Baystars last Friday. It was third of four consecutive shutout losses for the Baystars - so far the new ownership is getting the same results. Some of the most interesting (to me anyway) Japanese card sets were those produced by the Yamakatsu company in the late-1970's. Yamakatsu produced 10-20 sets between 1976 to 1981 - I'm giving a range rather than an exact number as it's not entirely clear what should constitute a set vs what would be considered "premium" cards associated with a set. 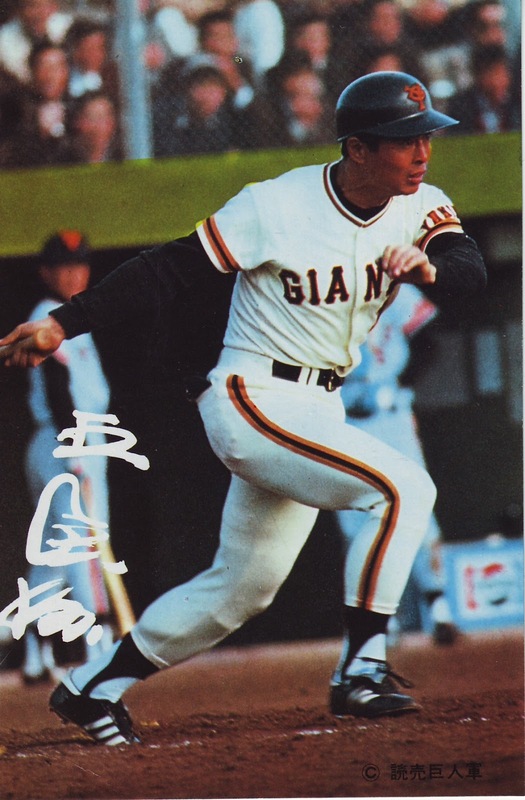 Gary Engel's latest Checklist lists 15 "regular" sets along with 5 "premium" sets - earlier versions of the Checklist have listed a different number of sets (including a set called "Super Giants" from 1977 that is no longer thought to have been produced by Yamakatsu). One of the hallmarks of the Yamakatsu cards is mostly beautiful pictures on a "pure card", often borderless format. 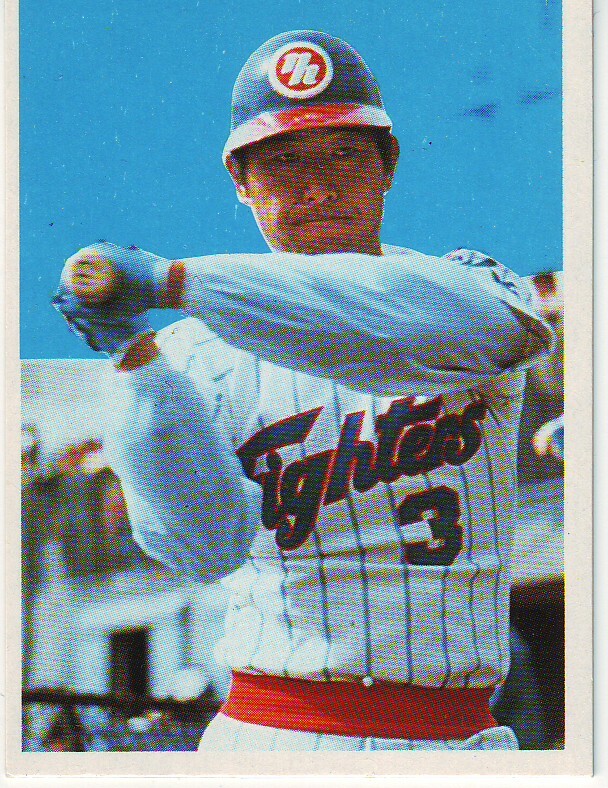 One of the weaknesses of the cards (in my mind) is the frequent repetition of pictures between sets and the use of blank backgrounds occasionally. 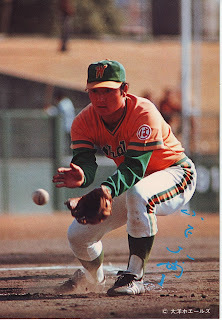 Most of the confusion centers around the large cards Yamakatsu produced in 1976 and 1977. The first set Yamakatsu produced is believed to be the "Blue Box" set from 1976 (getting its name from the color of the box the cards were sold in). 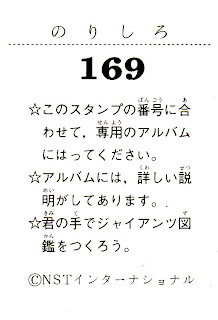 This set (referred to by Engel as JY1) contained 21 cards, 3 of which were denoted as "winner" cards, although I have no idea what (if anything) was won. The cards were 6 3/4 inches by 9 13/16 inches in size and were blank backed (expect for the "winner" cards which had a couple lines of Japanese text on them which was unrelated to the player shown on the card). 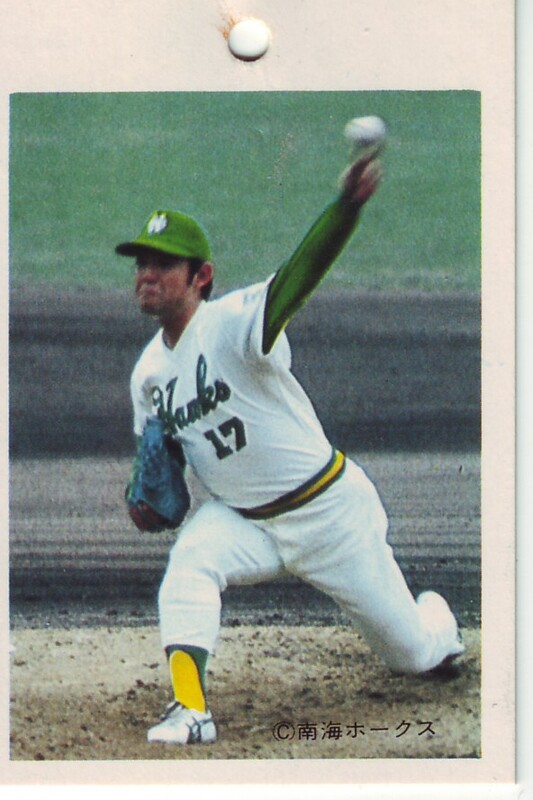 Apparently, Yamakatsu issued two more blank backed card sets in 1976, both sold in a green box. One was a 29 card set with cards slightly larger than the original, blue boxed set (JY1a). 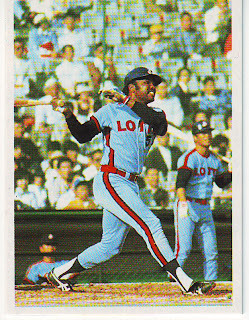 The other was a set of at least 16 cards that were the same size as the JY1 set (JY1c). I don't have any of either of these two sets but they look the same as the JY1 cards (and in fact many cards use the same photos). 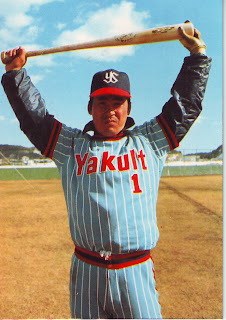 The JY1a set had a "premium" set associated with it know as JY13. It was a folder with a Giants logo and a postcard sized card of Sadaharu Oh and Isao Harimoto attached by tape on the outside. Inside were two additional postcards - one of Oh hitting his 700th home run and one of Harimoto getting his 2500th hit, along with a yellow sheet containing both of the player's batting records. 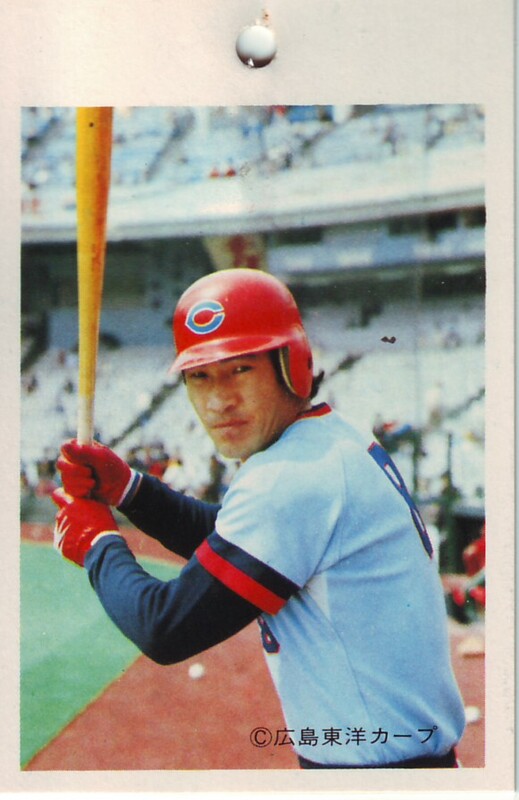 It looks like Yamakatsu issued another set (JY1b) in late 1976/early 1977 that used mostly the same pictures as JY1, but the cards had text on their backs with biographical and statistical information about the players. There was also a "premium" set associated with it (JY15) that consisted of 8 huge (12 inches by 18 inches) cards. 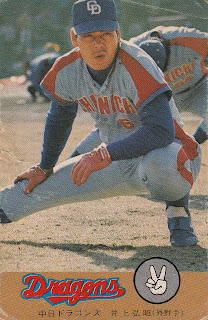 Four of these cards were placed in each box of the regular set. Unfortunately, I don't have any of either the regular or premium cards for this set. 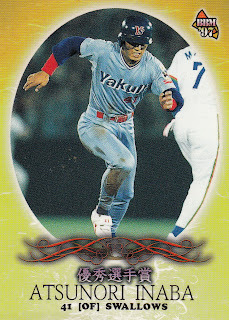 I do, however, have cards from the next set, known as JY3 or the Green Box set. 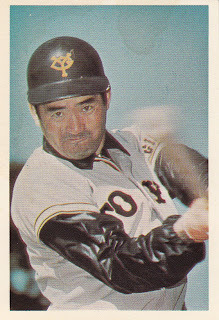 This set contained 29 cards with player information on the backs. The cards were still 6 3/4 inches by 9 13/16 inches in size. 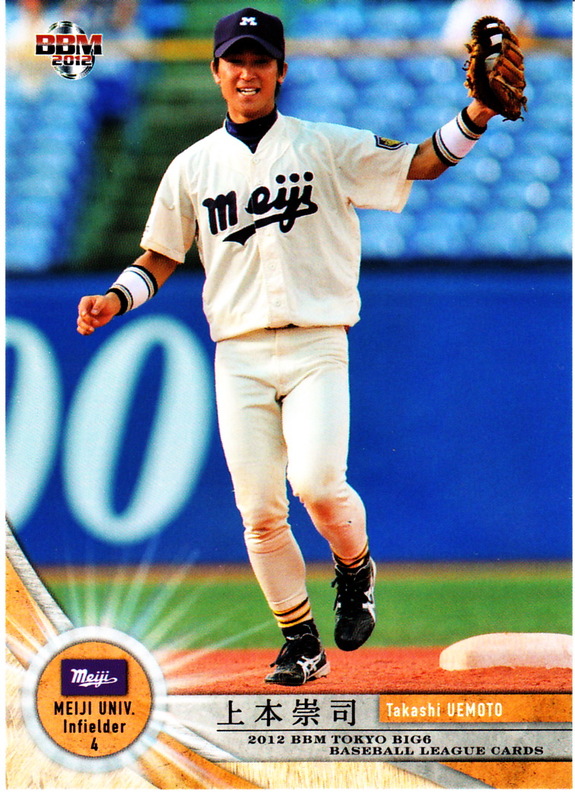 There does not appear to have been a "premium" set associated with this set. The next set from 1977 was the JY4 "Photo Wrapper" set, so named (obviously) because the card wrappers had photos on them. At 6 9/16 inches by 9 3/4 inches, these cards are slightly smaller than the previous issues. 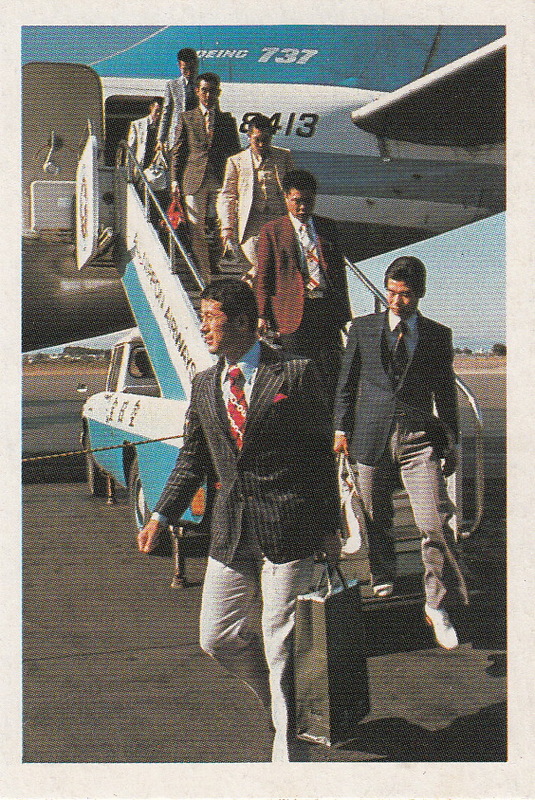 Again, the backs contained biographical and statistical information about the players. The set is listed as having 29 cards, but I believe the Takashi Yamaguchi card I'm showing below is from the set but is not listed by Engel (and in fact I think it used to be listed as part of the set in earlier versions of the checklist). 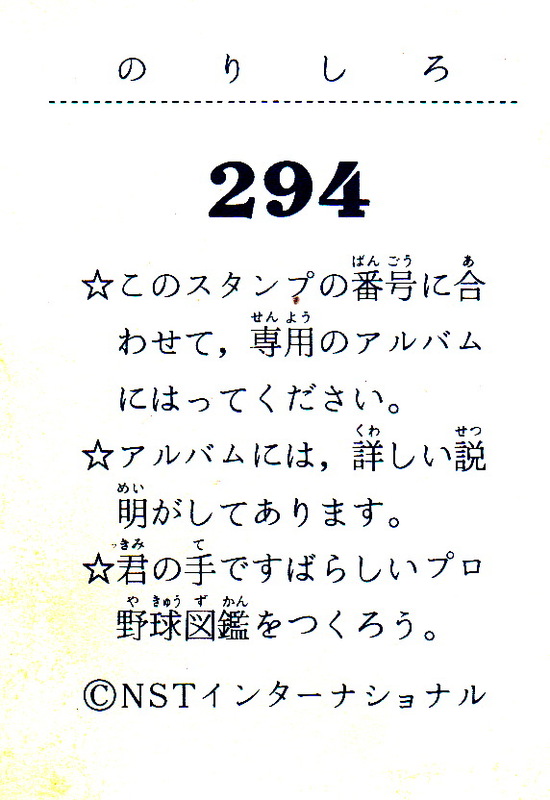 The JY4 set had two related, team specific sets. 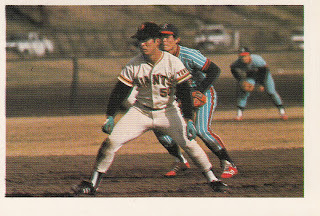 JY4a is a five card set containing just cards of the Giants while JY4b is a five card set containing just cards of the Tigers. 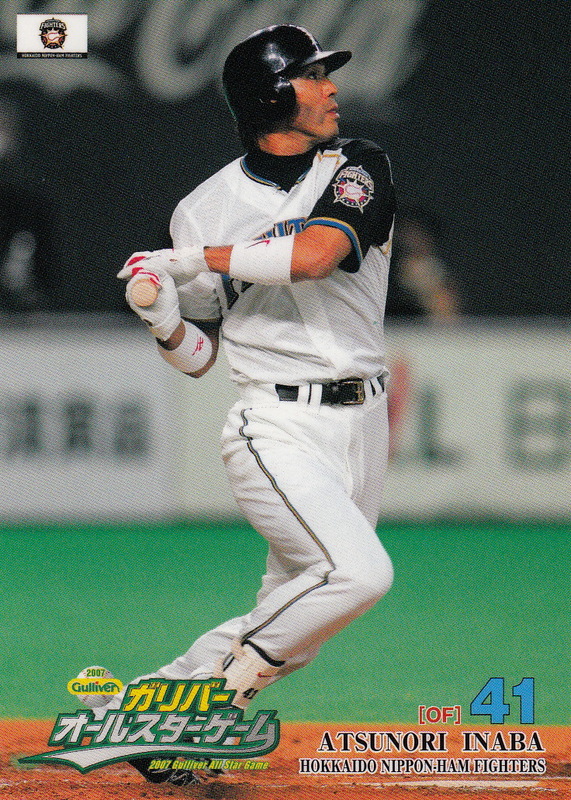 The cards are the same style and size as the JY4 cards but with the exception of a Masayuki Kakefu card, all the photos are different than the JY4 cards. These cards were sold separately. As you can see, there's really nothing to distinguish one set of cards from any of the others, other than some variation in size (and the cards from 1976 being blank backed). 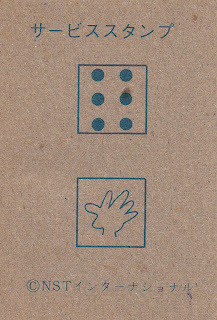 As Engel says, the only way to really be sure which cards came from which sets is to actually open a box of cards and see what's there. 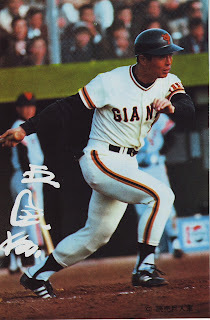 There was another oversized "premium" set associated with JY6 known as the "Signature Cards" (JY7). 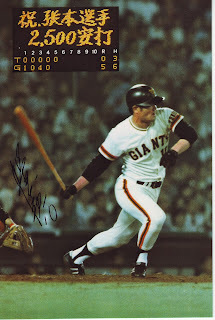 These were 9 1/2 inch by 10 1/2 inch cards that had a player photo surrounded by facsimile autographs of many players. The cards were available through some sort of mail-in redemption of specially marked JY 6 cards. 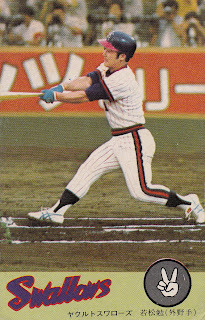 I have no idea why Yamakatsu stop making cards after 1981, but it is a shame. 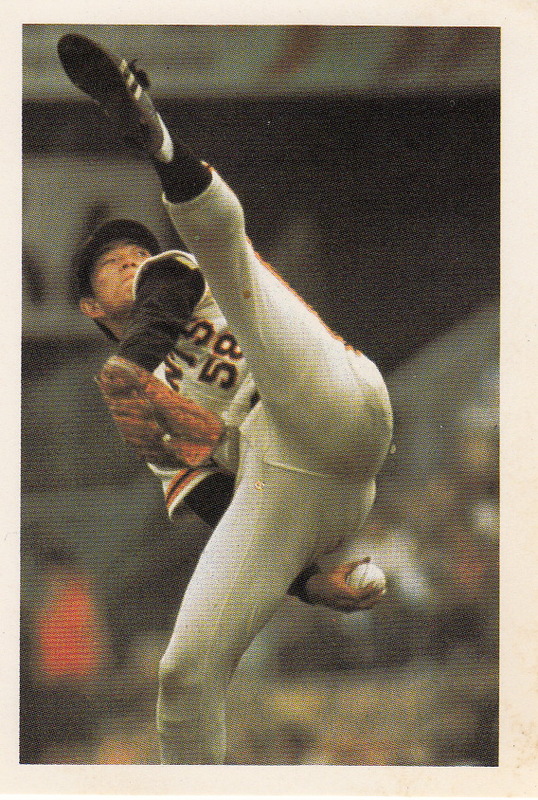 A lot of their cards were beautiful. There are a lot of things that I'd be interested in finding out about them. Why is one of the biggest stars of the 1970's - Katsuya Nomura - not in any of their sets? 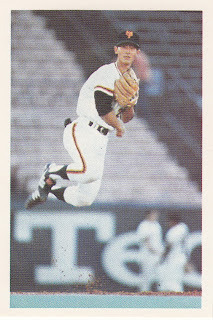 Why are there no Giants players in the JY16 "Badge" card set - there's a couple cartoon cards with stats on them but no players (the cartoons are of a Giants mascot, not a caricature of a player)? 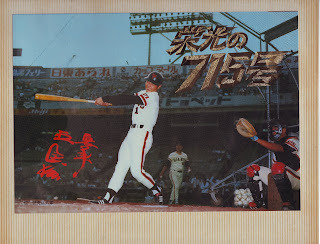 Is this Yamakatsu company the same Yamakatsu company that made bromide and menko cards in the 1950's?